Another Great Blurb for THREE BLONDE MICE! I love Jane Heller’s quirky off-kilter novels! 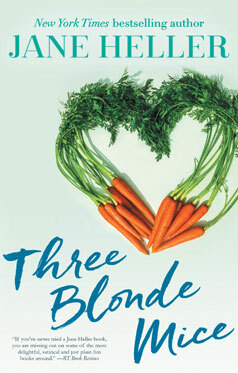 In Three Blonde Mice, Heller and her keen-eyed wit cook up a wonderful satire on chic cooking classes, farm-to-table food groupies and chefs with the egos of rock stars. She dissects love – and conjures up a murder plot – with the sharpness of a paring knife. I enjoyed every delicious moment. It’s always fun when something good happens to people you care about, and my pal Melodie Johnson Howe has not only launched the ebook publications of her award-winning mystery novels and a short story collection, but she’s the subject of a new promotional video too – all ahead of the summer publication of her latest mystery, City of Mirrors. The video went up on YouTube today and it’s totally worth a look. We get to see clips from Melodie’s career as a young Hollywood blonde co-starring with the likes of Clint Eastwood as well as her thoughts about being a mystery writer whose backdrop is Hollywood. For those who want to write, say they want to write, dream of being able to write, Melodie is your role model. She walked out on show biz, studied the craft of writing and put in the time – all while raising a family. No excuses, people. I get that none of us wants to grow old(er). I get that once we reach a certain age, the giddy excitement we experienced as kids at birthday time is no longer giddy. And I get that age can signal an end rather than a beginning. But hold on a sec. Melodie’s a great example of why all of the above is only part of the story. The other part is that there’s plenty to celebrate no matter how many candles are on the cake. She just published a book of short stories called Shooting Hollywood. She just sold a new novel to a major New York publisher. She just got all these fabulous blurbs for the novel from other critically acclaimed mystery writers. And she just made a deal to publish her earlier novels, The Mother Shadow and Beauty Dies, in their first ebook editions. An end rather than a beginning? I don’t think so. A former actress in feature films and television, Melodie has a cameo in YOU’D BETTER NOT DIE OR I’LL KILL YOU. She appears in Chapter 7: How to Wait Out Waiting Rooms. During one of Michael’s surgeries in 2010, she sat with me in the waiting room at Cottage Hospital in Santa Barbara and kept me sane. She even managed to make me laugh – something she does often. And when the surgeon came out of the O.R. to discuss how the surgery went, she was right there to ask questions, listen, support me. Why wouldn’t I want to celebrate her birthday? We caregivers should treasure those friends who stick by us in sickness and in health and make sure they have their tiramisu and more. It’s always exciting when someone you know and root for has a success to celebrate, and yesterday was no exception. Melodie Johnson Howe, my friend and former Muse Madams workshop cohort, has compiled her critically acclaimed short stories into a new collection called Shooting Hollywood. She had a signing party and gave a talk not only about writing mysteries (her first novel, The Mother Shadow, won an Edgar Award) but about basing her stories and her main character, Diana Poole, on her own experiences as an actress in Hollywood. Back in the day, Melodie co-starred with Clint Eastwood, James Caan, James Farentino and others, but she always wanted to be a writer and decided to give up acting to pursue her dream. Now she’s turning out terrific short stories and has just finished a new novel. What’s especially fun about Shooting Hollywood is that Melodie introduces each story with a short piece about how she came up with the idea for the story. It’s like having an inside view of a writer’s process and discovering that inspiration comes in mysterious ways. Speaking of which, I need to get back to work on the novel I recently started. Between converting my early novels into ebooks and copyediting the caregiver manuscript (not to mention waiting for the refrigerator guy to show up and figure out why the freezer keeps leaking), I’ve been mighty distracted lately. Melodie has inspired me to get to work! It was my friend Melodie’s birthday the other day, and we always exchange presents. She’s a mystery writer and, like me, sits at the computer all day. (Check out her web site on the links list over on the right.) The problem is that every time I shop for a gift for her, I always end up buying the same gift for myself. So there I was at a store in Santa Barbara, browsing aimlessly, not knowing what I was looking for, when I finally told the saleswoman that I had this friend who was a writer and I didn’t want to spend a ton of money but I wanted to get her something pretty and well-made and useful. Bingo. I tried on the gloves, wiggled my fingers around and thought I had hit on a miracle. My hands are often cold when I’m working. Yes, I live in California, but I’m way up in the hills where the temperature dips in the winter. How exciting to have gloves that would allow me to type but keep the rest of my hands nice and toasty. Melodie loved hers. And I’m wearing mine right now. So it’s kind of my birthday too, even though it isn’t. What’s a writing dog, you ask? A dog that will sit quietly in my office playing with his doggie toy or taking a nap or otherwise occupying himself/herself while I work at the computer. My friend, mystery writer Melodie Johnson Howe, has a dog named Watson and he sits in her office while she works. She says he’s excellent company. I want excellent company too. It gets lonely in here. I even have my writing dog all picked out. I saw one of these Bichon Frise pups during my walk one afternoon and fell madly in love. I came home from my walk and had the following conversation with Michael. And that was the end of that, because I really had no comeback. I knew he was right. I don’t even have any potted plants in the house. I’m not ready to take on a dog or any other addition to the household, because I have a book deadline and book deadlines are more time consuming than training a dog. I think a stuffed animal is where I’m headed.